Late Apple co-founder Steve Jobs viewed designing a product as the process of "keeping 5,000 things together in your brain" and getting them to fit together, according to an excerpt from the forthcoming screening of "Steve Jobs: The Lost Interview." In October, journalist Robert Cringely announced that footage of a 70-minute interview with Jobs from 1995 had been rediscovered after the master tapes were lost. The interview has since been restored and is set to screen at Landmark Theatres locations around the U.S. later this week. 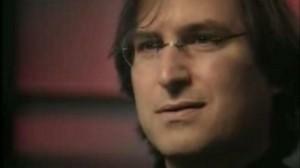 TIME has obtained an excerpt from the film where Jobs describes his philosophy on product design. According to him, the process of finding new ways to fit disparate things together is "the magic" behind design. "Designing a product is keeping 5,000 things in your brain, these concepts, and fitting them all together in kind of continuing to push to fit them together in new and different ways to get what you want," he said. "And every day you discover something new, that is a new problem or a new opportunity, to fit these things together a little differently." The interview, filmed for the "Triumph of the Nerds" miniseries, reveals Jobs during his "wilderness years" after being ousted at Apple and before being brought back to Apple by way of NeXT. Clips of Jobs' comments from the series have since gained notoriety because he did not hold back on his feelings about longtime rival and Microsoft co-founder Bill Gates. "The only problem with Microsoft is they just have no taste," Jobs said. "I have a problem with the fact that they just make really third rate products." Even toward the end of his life, Jobs' opinion of Gates did not appear to have changed. In an interview with biographer Walter Isaacson, Jobs called Gates "basically unimaginative." He "has never invented anything," Jobs reportedly said. "He just shamelessly ripped off other people's ideas." Gates has said he's not troubled by Jobs' comments. "We got to work together," he said recently. "We spurred each other on, even as competitors. None of that bothers me at all." Steve Jobs during a 1995 interview with Robert Cringely. During the interview, Jobs also had strong words for John Sculley, who he had brought from Pepsi on to be CEO. The two clashed after Sculley began work at Apple, and Jobs was eventually ousted from the company he helped found. "I hired the wrong guy," he said. "He destroyed everything I spent ten years working for. Starting with me but that wasn't the saddest part. I would have gladly left Apple if Apple would have turned out like I wanted it to." For his part, Sculley has admitted that it was a "big mistake" that he was ever hired as Apple's CEO. He spent ten years at the company before being forced out in 1993.